Gas chromatography is an analytical separation technique used in the separation and analysis of samples. The separation occurs between a gas mobile phase and a liquid stationary phase. The sample used in the gas chromatography should be able to vaporize without thermal decomposition. The sample of concern is mixed with the mobile phase and injected into the gas chromatograph. After vaporization by heating, the sample enters into the column with a liquid stationary phase. At the end of the column, detectors produce a chromatogram by identifying the compounds progressing down the column. Gas chromatography is a technique used in the separation of a mixture of volatile compounds based on their mobility through a stationary phase. It uses a gas mobile phase and a liquid stationary phase. The mobile phase can be inert gases such as argon, helium or hydrogen. A thin layer of liquid stationary phase coats the inner side of the column used in gas chromatography. Gas chromatography is mainly used for both qualitative and the quantitative analysis of molecules within a mixture. The sample mixture should be able to vaporize in gas chromatography to move along with the gaseous mobile phase. The molecules of the mixture interact with the stationary phase inside the column. The molecules with fewer interactions with the stationary phase move faster through it while the molecules with higher interaction with the stationary phase move slower through it. Generally, the mobile phase is inert and is non-polar. The compounds having low boiling points and low molecular weights interact more with the gaseous mobile phase. The compounds that have high boiling points and high molecular weights interact more with the liquid stationary phase. Instrumentation of gas chromatography is shown in figure 1. The polarity and the temperature of the column are the other factors responsible for the relative mobility of molecules through the column. If the polarity of the compounds in the mixture is high, they tend to remain in the stationary phase. Hence, nonpolar compounds move out of the column first. If the temperature of the column is high, the vaporization of the compounds in the mixture occurs faster; therefore, they come out of the column quickly. Gas chromatograph uses several types of detectors such as mass spectrometry, flame ionization detector, thermal conductivity detector, electron capture detector, etc. 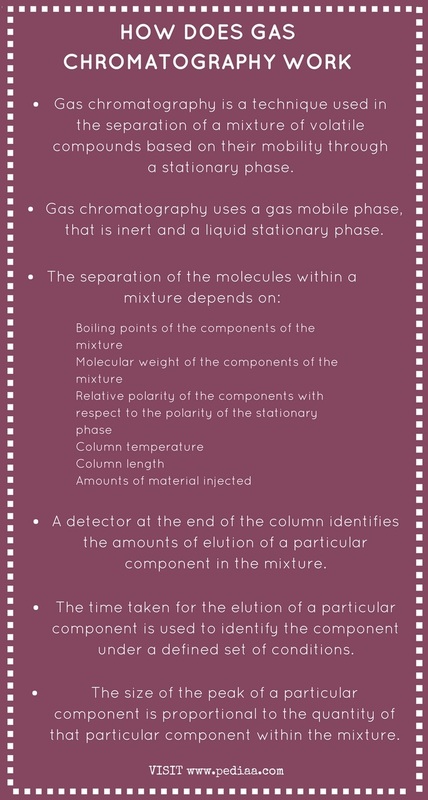 The detector at the end of the column identifies the molecules that come out of the column and produces a chromatogram with respect to the time taken for the elution, the process of removing an adsorbed material (adsorbate) from an adsorbent with a liquid. When a particular type of component of the mixture comes out from the column, it is shown as a peak in the chromatogram. The time taken for the elution of a particular component is used to identify the component under a defined set of conditions. The size of the peak is directly proportional to the amount of that particular compound present in the sample. The first peak is due to the inner carrier gas, which comes out of the column first. The solvent used in the preparation of the sample elutes secondly. Gas chromatography is an analytical technique used in the separation of a mixture of volatile compounds. It uses a gaseous mobile phase and a liquid stationary phase. The simpler and more inert compounds come out of the column quickly while heavier and polar compounds take some time for the elution. 1. “Gas Chromatography.” Chemistry LibreTexts, Libretexts, 21 July 2016, Available here.